Wouldn’t it be great if we could all predict the outcomes of sporting events prior to them starting? That way we could all make loads of money and bankrupt the bookmakers! Unfortunately, there is no such thing as sure betting tips, but of course you maximise your chances of securing long-term profit from your wagering by signing up for a service that has delivered proven returns to its followers over a number of weeks and months. One such website is JohnnyBet, a community of some of the best tipsters around. But don’t take our word for it: have a look around the site and see for yourself. These tipsters offer tips and predictions for some of the biggest sporting events on the planet, as well as those more niche matches so that you can maximise your profit each and every day. Customers can follow the Tip of the Day, and read the various articles that are published each week that offer a helpful guide as to where the smart bets are. So if you are looking for reliable betting tips from a proven team of winners that have a wealth of tracked profit behind them, or if you fancy yourself as a top tipster, then it is easy to get involved. Simply register with JohnnyBet today. There can’t be many better opportunities for aspiring tipsters to show their skills than through JohnnyBet. Not only are their tips and predictions proofed and viewed by thousands of bettors across the globe each and every day, there is also that huge €2000 prize pool to play for each month! Now expert tipsters can really make their predictions pay. JohnnyBet is a fully transparent service, and what that means is that no tricks are played in terms of ‘managing’ results. 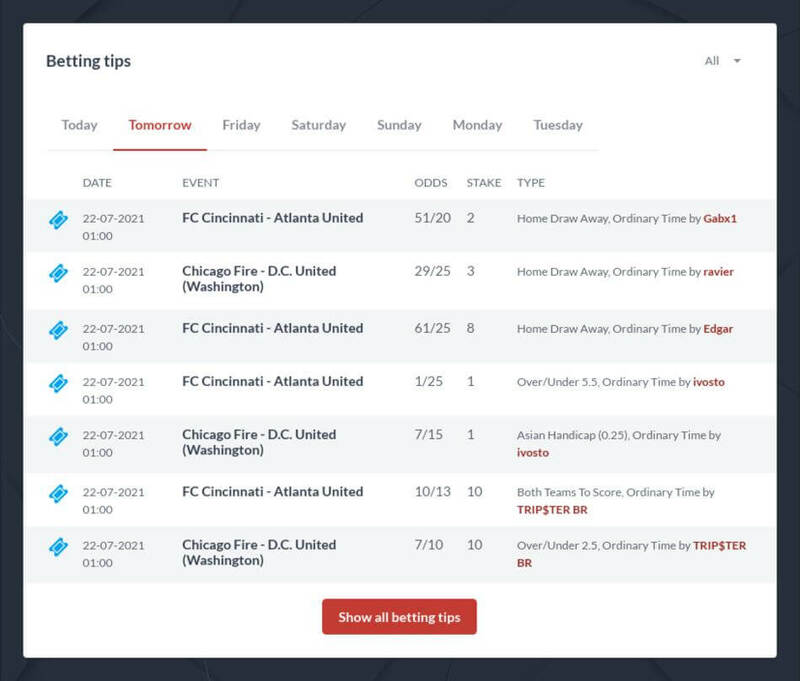 Each tipster uploads their predictions to the site, and their personal statistics are calculated and recorded so that all bettors are able to see them – whether they are in profit or otherwise. These records include profit and loss percentages, amounts staked, and the selections themselves. This way bettors can see if a particular tipster meets their needs in terms of budget and markets covered. It really is a two-way partnership: tipsters who wish to showcase their predictive skills can do so to a worldwide audience while getting their results proofed, and website visitors get to sift through a community of quality tipsters, of whom many are returning outstanding profits, and back their selections accordingly. Pretty much every sport under the sun is covered by JohnnyBet’s community of tipsters, so customers of all persuasions can access the very best insight online. You can find Football betting predictions, Basketball and even sports like Horse Racing or E-Sport. Take SallyBoom, for example, or ‘The Horse Racing Kid’ to give his preferred title, the two-time JohnnyBet Expert of the Year. At the time of writing he topped the Tipster League with an incredible 28000 units of profit, earned mostly from – you guessed it – horse racing tips. But he also covers football, cricket, baseball and a host of other sports too. His tactic is to wait for the right selections to come along, rather than tipping lots of times per day, which makes him calculated, precise style of betting so successful. And how about Koki1989, whose strategy is slightly different to that of SallyBoom. He posts tips at huge prices, and so while his win ratio percentage isn’t great his profit figures – his yield was at 17% at the time of writing – is exceptional. In the past few weeks alone he has celebrated 19.00 and 16.00 winners. This approach is not for the faint hearted, but Koki1989’s results speak for themselves. We mustn’t forget the football and tennis expert, Josico, either. His statistics are outstanding: a 29% yield on more than 200 tips – that’s more than 500 units of profit! This goes to show the diversity – and profitability – on offer from the JohnnyBet community of tipsters. What could be better than having access to a suite of winning tipsters and their predictions? Not having to pay a penny for the privilege, of course! That’s right: there is no charge for signing up to the JohnnyBet service. No one-off joining fee, no monthly subscription, nothing. Quite simply, this is a service bringing together tipsters and bettors simply because they love bashing the bookies! So there is no need to pay for sure betting tips and predictions, when you can get them for free. The rewards for punters are obvious, as they are for tipsters themselves too. There aren’t many places these days that offer a completely free proofing service, and ultimately that is what a tipster must use to show their credentials in returning consistent profits. Many such tipster services could charge good money for the results that JohnnyBet are getting, and so it is testament to them that their service remains completely free. If you are looking for reliable betting tips for tomorrow, the day after or into the future – without the need for parting with your cash prior to even placing your wager – then you know what to do. Sign up today!